This article provides the instructions to create a user group, move the group to a different network, and assign existing users to individual or multiple user groups. Click the Add user group button in the Groups section. In the Create a new group page, enter in the Name and Description of the user group. 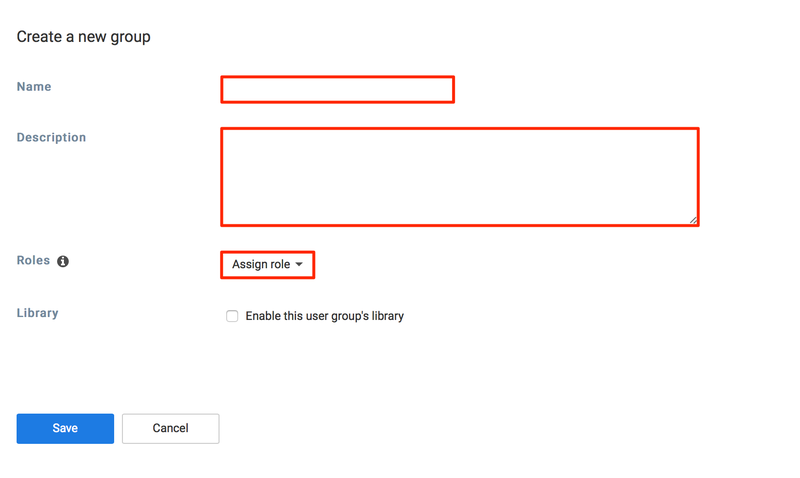 Select the roles which would be inherited by users within this user group in the Roles dropdown menu. Multiple roles may be selected. Slide the Enable this group’s library option to YES, to enable the group library. The user must already exist in the system. To add a new user, please refer to Create and send user invitations. Select the user(s), and click the Assign user groups button. In the Assign user groups window, Enter in or select the user group(s) you wish to assign the user(s) to. Unable to move user group if current user is part of the user group. Select the user group you wish to move, and click the Edit user group button. In the Edit user group page, click the Change Network link. In the Network window, select the desired network to move the user group to, and click OK. You may use the Search bar to locate the desired network. In the Confirmation window, Click Confirm to confirm the move. In the Edit user group page, the newly selected network appears in the network field. Click Save to apply changes. Unable to delete user group if current user is part of the user group. When you delete a user group, the group’s library and all its content will be deleted. However, the user will not be deleted. Select the user group you wish to delete, and click the Edit user group button. In the Edit user group page, click the ‘Delete user group’ link. In the ‘Confirm delete user group’ window, enter in your Appspace account password and click Confirm.